Size: Size: Length: 32.6cm (12.8 inches), Width: 3.1cm (1.2inches), Height: 0.25cm (0.1 inches). 【Ultra Premium Japanese Surgical Grade Stainless Steel 】This sushi knife is made of Japanese surgical grade stainless steel that up to HRC( Rockwell Hardness Scale) of 59-61 which ensures the 2x harder than other brand knives. 【2/3 Tang Gray Leather Wooden with Double Riveted-Durable】 Ergonomic D-shaped gray leather wooden handle with Double Riveted-Durable is more durable&fastness and balanced than full-tang without Riveted-Durable. 【Superior Razor Sharp Blade】Superior quality razor sharp blade provides sashimi knife maximum sharpness and edge retention that can slice through raw fish, sashimi,sushi and rice roll with no pressure.Single-edged design to give more control on slicing thin pieces of fish! 【Keep Original Taste】 This sushi knife is single-edged and it's good for slicing but not recommend for chopping. 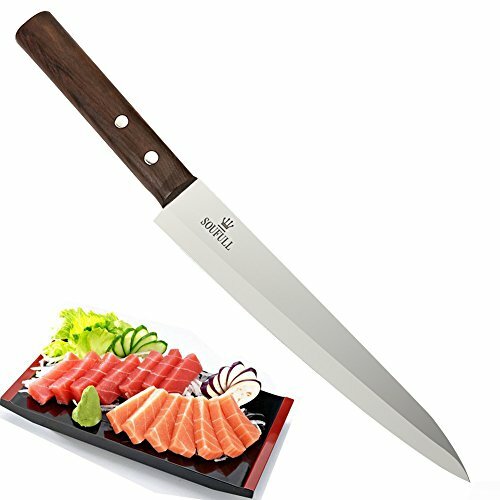 The material of this sashimi knife ensures the original taste while other knives can damage the quality and alter the taste. Have a good and healthy meal.